Matchday 21 in Serie A will pit two sides vying for a champions league spot when AS Roma travel to Bergamo to face a high-flying Atalanta. Eusebio Di Francesco’s side currently occupies the fifth spot, just two points ahead of their Sunday opponent. A win for Atalanta, coupled with events in Milan, could send them into the top-four for the first time this season. After an indifferent start to the campaign, Gian Piero Gasperini’s men are unbeaten in four matches, which included a thrilling 2-2 draw at home against Juventus. Since losing to Genoa in December, the Bergamo outfit has scored 15 goals and won three matches. That streak has also propelled Duvan Zapata to the top of the scoring charts, level with Cristiano Ronaldo and Fabio Quagliarella on 14 goals. Roma head coach Di Francesco is wary of how dangerous Atalanta can be, especially at home against the top sides. They hammered Inter 4-1 and nearly ended Juventus’ unbeaten run in the league on Boxing Day. Atalanta are the highest scoring team in Serie A this season with 44 goals. They have scored three more than Juventus and five more than Napoli. Atalanta striker Duvan Zapata has scored in seven straight league matches, including four goals in his last outing against Frosinone. Both Roma and Atalanta have won their last three matches in Serie A and scored at least two goals. Atalanta: Berisha, Toloi, Mancini, Palomino, Hateboer, Pasalic, Roon, Castagne, Gomez, Ilicic, Zapata. Roma: Olsen, Florenzi, Fazio, Manolas, Kolarov, Nzonzi, Cristante, Kluivert, Zaniolo, El Shaarawy, Dzeko. Stadio Atleti Azzurri d’Italia has witnessed goals galore this season. Atalanta have been scoring goals for fun but are also the side who have conceded the most goals in the top-eight. This will be an intense game with massive implications on the final champions league spot in the table. AS Roma managed to hold onto their lead against Torino last weekend but this will be a big test. 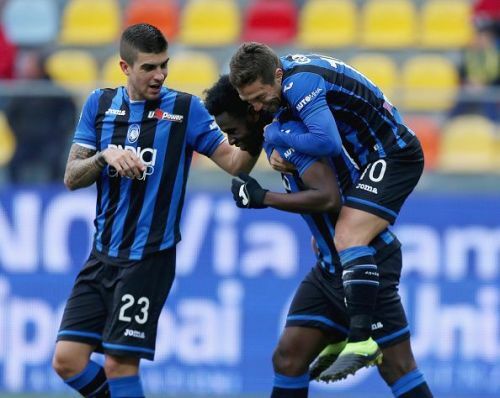 Atalanta difficult to beat at home and with Duvan Zapata in the form of his life, this promises to be another goal-fest.